Planning for the most likely SHTF Scenarios. When you’re just getting started in the world of prepping, preparing for an EMP or an Asteroid hitting the earth is probably not the best course of action. While both of those scenarios are certainly scary, the probability of them happening is pretty low. That’s not to say that you shouldn’t prep for these things, I’m just suggesting that you prep for the most likely dangers first. What are the most likely threats that you should be prepared for? Deciding what types of disasters to prepare for will mean something different to everyone. From you location, to your health and financial situation, there are a number of factors that can play into what you should focus on first. While we can’t tell you individually what to prepare for, there are a number of things that you might want to consider. Remember prepping isn’t just about preparing for cataclysmic events; it’s about being prepared for whatever dangers or pitfalls are around the corner. While the loss of a job may not be as sensational as asteroids, EMP’s, or a zombie apocalypse, it is the one thing that almost everyone reading this will face at some point in their life. Preparing yourself and your family to survive and thrive during a time of unemployment is something that everyone should be prepared for. Ask yourself the following questions…. If you lost your job today, how long could you go without a paycheck? How much food do you have on hand, and how long will it last? What steps do you need to take to ensure your families survival? When we start prepping, it’s easy to get caught up in a worst case scenario mentality. While preparing for the worst is a good thing, it can sometimes cause you to overlook the smaller disasters that can be equally as devastating as their larger counterparts. One of the most common disasters that most Americans will face in their lifetime is the threat from Fires and Floods. Again, it might not be the most exciting topic in the world, but preparing yourself and your home for this danger is one of the first things you should learn how to do. Hurricanes, Earthquakes, and Tornadoes are all disasters that often strike without warning. But they are also easily predictable. While you can never predict exactly when they’ll happen, you can find out if you live in an area that’s prone to one of these natural occurrences. Unfortunately, as we often see every hurricane season, most people fail to prepare for these types of events. If you live in an area that’s prone to natural disasters, you need to start prepping to survive those situations. As farfetched as this may sound to some, it really shouldn’t be that shocking. All you have to do is look back at 2008 to see how close this country came to a complete financial meltdown. Although the idiots in the media claim the economy is recovering, just remember, they’re the same idiots that didn’t see 2008 coming. If the economy crashed tomorrow what would you do? Are you ready for this type of scenario? It’s often the dangers in your own community that pose the biggest threat to your health and safety, are you prepared for them? Do you even know what they are? Is there something in your community that could make your town a potential terrorist target? Are there chemical or power plants in your area that could pose a danger if an accident happened? Are there areas of your town that pose a danger because of crime, gangs, or other criminal activity? If a disaster hit, would these people pose a threat to your home? Bad things can happen quickly and often without warning. Knowing what types of events are most likely to occur in your community can help you plan for those disasters. 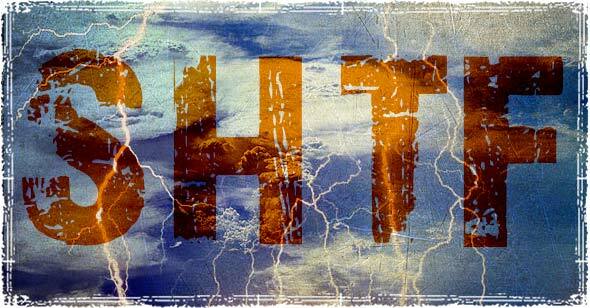 If you start with the mindset of being prepared for these common problems, you will then have a good foundation to build upon that can help you survive pretty much any crisis, disaster or SHTF situation. Great post? I hate to say it but with all the crazy stuff that I plan and prep for losing my job never really crossed my mind but it makes prefect sense and is a real concern these days. Most of my preps will help me through but I should probably have a little more money in reserve in case it happens. My husband lost his job Feb. 2011 and wasn’t able to find another til Dec. of the same year. It was my stocking up that kept us from going under. We had just enough coming in from unemployment to pay utilites and housing every month, but food (and the “extra” needs of a newborn)for a family of 4 was out of the question. Yeah, I’ve had to restock, but the investment saved our rears. Know what you need the most and prepare for it. “Emergency” means something different to each family. We are now in the process of moving out of the suburbs and into a place with free gas (well on the property) and no city services like city water and sewer. Just eliminating those bills and a cheaper house payment with enough property to grow our own food (milk, meat, eggs and veggies) will keep a job loss from ever threatening us that badly again. My husband was laid off and our food stores helped stretch my income until he got another salaried position. we cut back on everything and got a lower car payment but it was about the longest 18 months of my life. thank god for our emergency closet! i honestly don’t know what we would have done without it. in every one of the senarios having good bright LED lights that only use 5 watts instead of 100 watts is a great idea to save your batteries on an off grid system or even if you were running a generator….Savwatt has full floodlights in LED regular replacement type and even giant street lights and stadium LED light bulbs…… our bulbs price points are half the cost of other companies and they are made in America !! most for homes are so far beyond the Posionous CFL Mercury bulbs in both price and efficiency you will save 80 to 90 percent !! even over CFL bulbs send me an email and check our site…….I am here to help you thru these potential dangerous times ahead !! I am preparing for increased prices for food and fuel, and static income via social security. Hence soc. sec. payments is one of our primary forms of income. Also, as the economy suffers, the straps on our tenents tightens. Late rent and worse is the theme in recent years. I am anticipating for that to get worse. Hence, how we will pay our expenses, and property taxes. The answer: silver? maybe? That is how we are preparing – wrong or right. I have been prepping for 2 years in anticipation of an economic collapse and hyperinflation. Agree,it may start with the econ.the markets are way over valued,a major adj. could bring hiper inflation and a devalue of the dollar,..think 20 trillion.If you spent 1 dollar every second of the day it would take 32,800 yrs to spend 1 (one trillion)….20 ? ……. It’s 2015. Still going strong. My dad’s in the top 5 investors of Canada, I should know. Then get off a prepping site with all your moneys if you think everything is so grand. greetings VAV prepper,i’m a va prepper as well(since 95). one thing to consider is the season you may need it. build it for winter then it will work for the other 3.or rebuid it every 3 months and adj. it for the season you in. Seen the oil prices recently? We’ve been preparing for an economic collapse and documenting the plans on our site. While I feel we have a long way to go in prepping, we’re getting there week by week. I think this country (US) is in for rude awakening – let’s hope more are prepared than less. I like your idea. I live in the uk and it’s something I’m going to have a good think about. Because i have a young family I’d be nervous about sharing my bugout location with strangers. I’ve had my SHTF plan for a few years now but has only ever included my family and parents. Definatly food for thought. I also believe we will have an economic depression my self. i am concerned anbout the war that follows more than i am the depression though,i am ready for the worst and hope that more than just a hand full of us americans are too. Think about lids being scared of the dark! Especially if you are in the wilderness and don’t want them scared here’s a $.98 cure. At wal-mart they have your sidewalk lights gor this price. Solar powered . Also the bigger lights are cheap and have a AA battery inside. With these you can have your free flashlight power. To do it right, you have to go all out, and if you don’t, you might as well keep watching TV. To go all out, you first have to have a place to go to that has all the natural resources you need to be able to live without any help from society for as long as it takes. No open terrain and no where near a city. You have to have shelter that is underground…as far as possible..and for as many people as you care about. You have to not only have food and water but can get more without money. You have to say ”NO” to spending your money on crap that you can’t take with, and invest in gear that you can pack to survive with…and also gear for friends who you care about. Buy two of everything. You have to know how to hunt…and not with a gun that can be heard for miles. You have to be able to fully defend your location, supplies and people. You have to have a backup plan even to your ”plan”, and you better be able to to welcome whatever comes, or fear will overcome you. I don’t have a TV and just got back from roughing it. Assessment and Preparations does not have to be hard. We do not have to all become survivalists with our hardened bunkers and artillery. If most people would just just get informed, explore the threats in your area and the best ways to either mitigate that threat or to prepare for it, then start taking steps to work on it. Also, we should all realize that the Government WILL NOT be there when we need their help. Because of that I researched and created a program for family planning that has graduated steps; get your cars ready, prepare your bug out pack or, as I call it, a Take-Away-Kit, prepare your home/office shelter, finally be ready to evacuate with an evacuation kit. The program also helps you create a Famiy Emergency Plan based on what you learn and decide during different steps of the program. Of course, if you are smart, you can take it a step farther. I routinely add things to my kits and emergency storage shelves like long-term emergency food that will carry us for a few weeks, at first, to a few months now. Face it, we will never be totally ready for any and all contengencies. But with a little time invested we can identify the most critical threats and begin preparing ourselves for them. volcano going into the sea causing a super sunami in that event we would not be warned in time by design,how do you tell 50 million people 25/30 % are going to die.Keep the faith,keep looking up,where redemtion lys. How do I get my husband to be even a little concerned? He looks at how the 401K is up and down, mostly down. I say it could be wiped away in one afternoon, like 9/11. We live near LA, he grew up in LA and is Hispanic. He also thinks this is the best country in the world so thinks there is nothing to worry about. He says he doesn not have a roll over 401K, I don’t understand that…if someone could explain? I think we should be worried about everything as long as this entire administration is gone and buried. My husband won’t even save water, or canned food..how can you convince your spouse that this world is way more in danger then he thinks and though a conservative, chooses to live with his head in the sand? Having ample foodstuffs, multiple sources of and ways to purify water, substantial arms and ammo is a good start. Maybe being connected with a groupware or groups of other peppers is a good idea. I’m not ready to trust anyone with knowledge about my readiness.